Disambiguation: My name, Daniel P. McCarthy, is shared by many other people. I am not a conservative political commentator and contributor to The American Conservative; he also writes on church architecture. I am not a retired lecturer of Trinity College, Dublin; he also writes on liturgy. As far as I know, I am the only living Benedictine with this name. True to Benedictine form, I help people celebrate the liturgy with greater understanding and teach people how to conduct their own academic research in the field of liturgy. I teach and write on the Latin language with Reginald Foster OCD, and I give consultation on building and renovating churches. My recent interests concern how the good celebration of liturgy fosters human maturation and generative communities. During the Spring semester I teach Liturgy at the Pontifical Liturgy Institute housed at Sant’Anselmo, Rome. I offer courses in the history, Latin expression and theological meaning of the prayers of the liturgy. I spend Summers teaching graduate courses in liturgical research at the Liturgy Institute London co-founded with Dom James Leachman at Ealing Abbey, London. These courses are accredited by KU Leuven, Belgium, where I am a guest professor. In The Tablet of London I published commentaries on about 250 prayers of Sunday and feast day Masses: collects (opening prayers), prayers over the offerings, prefaces, prayers after communion and all four prayers of a mass considered together. I have also collaborated with Reginald Foster, OCD and James Leachman, OSB to produce an English version of these prayers to help the reader more adequately access the meaning of their Latin original. The commentaries on the opening prayers of Mass are collected in a book, Listen to the Word. The method of interpreting the prayers is presented in a more academic volume, Appreciating the Collect: An Irenic Methodology. What difference does being baptized, confirmed and brought into communion during the Easter vigil make in a person’s life is the question we asked in Transition in the Easter Vigil: Becoming Christians, which examines the history and the short prayers and texts of the vigil in the current liturgy. I collaborate with Father Reginald Foster, OCD, papal Latinist for forty years, now retired to Milwaukee where we are preparing to publish a series of books for teaching and learning the Latin language. The first book, Ossa Latinitatis Sola: The Mere Bones of Latin presents the bones of the entire Latin language in 105 encounters over three academic years, and should be available in September 2015. I teach Latin for liturgical studies and from the letters of Cicero in intensive summer courses at Ealing Abbey, London. In addition to summers teaching in England, I spend much of the year conducting my own research in liturgy and publishing in academic and pastoral resources. For this I reside as a guest of the monks of Keizersberg Abbey, Leuven, Belgium, to conduct research in their library and at the Maurits-Sabbe Library of KU Leuven, where I am on the theology faculty. State-side, I continue my research while visiting my confreres at the Abbey in Atchison and spend extended periods writing Latin books in Milwaukee. I published on liturgical ritual and architecture in a monthly series in The Tablet of London, soon to be available as a book entitled Come Into the Light. I gave consultation to Stanbrook Abbey in Yorkshire, England, for the new chapel they dedicated on 6 September 2015. The chapel won a RIBA award in 2016 from the Royal Institute of British Architects for its architectural design. I also gave consultation to the Mother of the Church Congregation in Warwickshire, England, for their recently rearranged chapel. I offer two Liturgy Weeks Architecture for Liturgy intended for architects and diocesan and parish officials responsible for building or renovating a church. These two weeks are based on the Master’s degree programme in Architecture and Arts for Liturgy developed by the Pontifical Liturgy Institute at Sant’Anselmo, Rome. The institute’s president has granted patronage to these two liturgy weeks. I am exploring the possibility of receiving accademic accreditation for these two Liturgy Weeks. and was ordained to the presbyterate on 15 June 1991. • Doctorate of Sacred Liturgy (S.L.D. ), Pontifical Institute of Liturgy, 2008. • Licensiate of Sacred Liturgy (S.L.L. ), Pontifical Institute of Liturgy, 2005. • I came to Sant’Anselmo, in the Fall of 1999 to pursue advanced studies in Liturgy. • M.A. in Theology studying Liturgy, University of Notre Dame du Lac, 1999. • M.Div., St. John’s School of Theology, Collegeville, MN, 1990. • B.A., Benedictine College, Atchison, KS double major in Philosophy and Religious Studies, 1985. 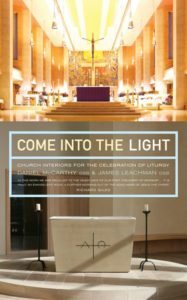 • The volume Come Into the Light: Church interiors for the celebration of liturgy considers the ritual experiences of liturgy and how these experiences are interpreted by the artistic narrative of a church and how these are supported by the architectural design of a church. The volume comprises 22 articles published by Fr James Leachman OSB and Fr Daniel McCarthy OSB in The Tablet of London. • With Reginald Foster I co-authored Ossa Latinitatis sola ad mentem Reginaldi rationemque: The Mere Bones of Latin according to the Thought and System of Reginald (a three-year presentation of the Latin language), Catholic University of America Press, Washington DC, 2015. • I co-edited and contributed to the volume Transition in the Easter Vigil: Becoming Christians: Paschali in vigilia Christiani nominis fieri, St. Michael’s Abbey Press, Farnborough, England, 2011. We ask what difference it makes in the life of a person to undergo the rites of Christian initiation by baptism, confirmation and communion during the Easter vigil. • I co-edited the volume Appreciating the Collect: An Irenic Methodology, which presents our method for understanding a collect, which is an opening prayer of the mass and the daily prayer of the liturgy. The method is from the Pontifical Liturgy Institute, and includes other contributions from an ecumenical scholarship in liturgy. 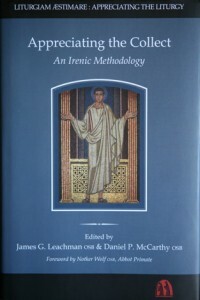 • I wrote a substantial article on the quality of the Latin language as it appears in the Missale Romanum: “Seeing a reflection, Considering appearances: The History, Theology and Literary Composition of the Missale Romanum at a Time of Vernacular Reflection”, Questions liturgiques / Studies in Liturgy 94 (2013) 109-143. An abstract of the article is available online. and the pdf is available by subscription. • I am co-founder of the Institutum Liturgicum, where I teach in Summer as a guest member of the faculty of the Katholieke Universiteit, Leuven, Belgium. • I am co-director of the project Appreciating the liturgy. Liturgiam aestimare: Appreciating the Liturgy. •I serve on the editorial board Quesitons Liturgiques / Studies in Liturgy.